“There are two ways forward: Either save capitalism, or save Mother Earth”, Bolivian President Evo Morales said, stressing that this was the choice facing governments at a May 7 press conference in New York. There, he discussed the outcomes of the 35,000-strong World People’s Summit on Climate Change and the Rights of Mother Earth with United Nations Secretary-General Ban Ki-moon. On April 26, a delegation made up of Bolivian government representatives and environmental activists from four continents officially handed over the summit’s proposals in the discussion leading up to the next round of UN-backed climate talks, which are to be held in November in Cancun, Mexico. 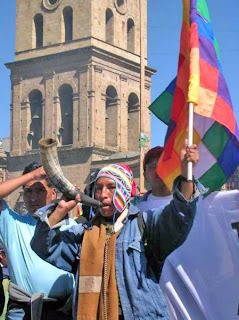 The proposals from the people’s summit — held in Cochabamba, Bolivia over April 19-22 — included a 50% reduction of emissions by developed countries, the payment of climate debt to developing countries, a proposed Universal Declaration on Mother Earth Rights, and a call to replace the destructive and consumerist capitalist system at the root of the climate crisis. Morales said: “If Cancun is the same as Copenhagen”, and the voice of the people that emerged out of the people’s summit is ignored, “then unfortunately the United Nations will lose its authority among people in the world”. Nigerian environmental activist and chair of Friends of the Earth International (FOEI) Nnimmo Bassey was a member of the delegation. He said the people’s summit had been “a turning point”. In a UN press statement Bassey said the outcomes of this summit had become organising tools to build a grassroots movement aimed at forcing governments to listen to the people that elected them. Speaking in Cochabamba, Bassey noted that his organisation, the largest international federation of autonomous environmental collectives with a presence in 77 countries, actively supported Morales’ call for a people’s summit on climate change “because we believe in the climate vision of the government and peoples of Bolivia”. “We believe that it is time for peoples and governments to sit together, draw up programs of action and act together” said Bassey, whose organisation’s work is summed up in three key words: “mobilise, resist, transform”. Bassey condemned the fact that the voice of the people had been excluded in many of the official governmental meetings. As an example, he said FOEI and many other organisations were locked out of the official negotiations in Copenhagen on some of the days. Here in Cochabamba, we have “a people-driven process: there is no corporate lobby present like in Copenhagen. Bassey said his organisation rejected the supposed “agreement” that came out of Copenhagen, “because if it is allowed to stand, poor and vulnerable nations will be exposed to grave danger”. Bassey also said FOEI opposed market-based solutions, saying these were just a scheme for countries and companies to “claim credits and get paid to release more carbon emissions into the atmosphere”. While these and many more demands for climate justice were enshrined in the peoples’ agreement that came out of Cochabamba. But one issue that did not was the thorny issue of fossil fuel extraction. This is in a in a context where the economies of many underdeveloped countries, such as Bolivia, rely on such extraction to survive. “Oil should be left in the soil, coal should be left in the hole, and tar sands should be kept underground” declared Bassey during his speech as part of the opening ceremony of the summit. Bassey said those who say “if we don’t extract oil, someone else will”, are ignoring the fact that the benefits of such extraction never go to local communities. Transnationals always ensure “investment is always directed to benefit the global North, and not for needs of the people”. He referred to the example of the struggle of his people in Ogoniland, where leading environmental activist Ken Saro Wiwa was killed in 1995 for protesting against Shell.